Most of these appear to be appx. 2" long (I did manage to use a measuring tape on one and it measured exactly 2") a few are perhaps a bit longer. In the picture the width of the landscape timber is 4" so you can judge the size of the cicada killer. I have noted the multiple partner mating on the ground as well as in the air. The cicada killers seem to spend most of the day around my front door and porch area, though I have been unable to determine where the nesting or burrow area is located. They generally appear about 9:00am and stay in the area until about 7:00pm. 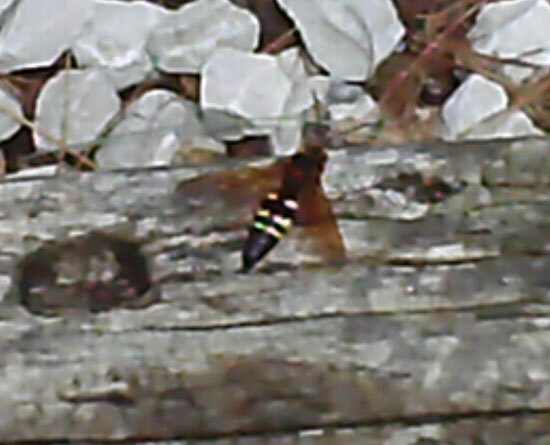 That is definitely a cicada killer. You are correct, somewhere around close by there must be a burrow. Look for a large mound of sandy soil or an opening in a wall or something. That is where the female will be. Good luck and let me know if you find it.